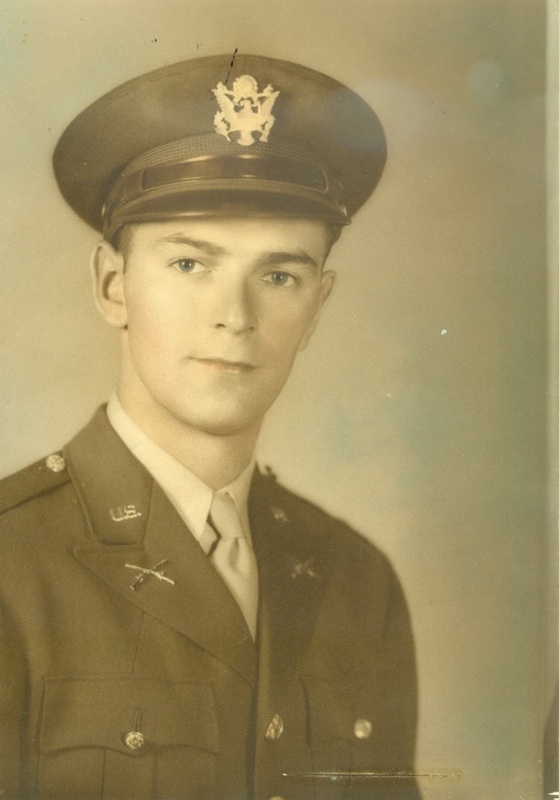 Frank W. Towers passed away July 4, 2016, at the age of 99. His beloved wife, Mary, survives him. Mr. Towers served in the 120th Regiment of the 30th Infantry Division during World War II. He landed on Omaha Beach on June 13, 1944, was wounded in Normandy and returned to his regiment to fight his way across France, Belgium, The Netherlands and Germany until the end of the war. 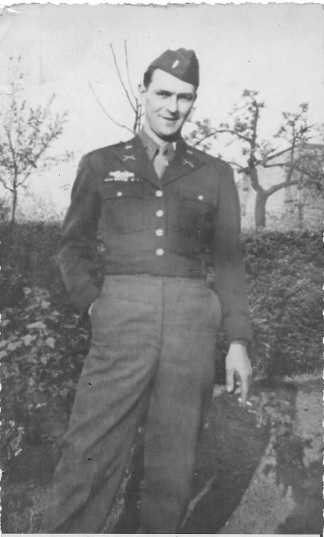 Frank Towers was passionate about the 30th Infantry Division and about remembering those who fell during the Second World War. He established the website of the 30th Infantry Division organization which I have referred to often. He was quoted in books, spoke at venues around the world and co-founded the Camp Blanding Museum. You can read his full obituary in the Gainesville Sun. See a beautiful picture of Frank and Mary at the Camp Blanding Museum on Memorial Day 2016. Or watch a YouTube video of Frank as he tells about liberating a train load of Jews being transported from one concentration camp to another. I will never forget how Frank’s face lit up when I asked him about how he met his wife. I could tell, as he launched into it, that it was a story he loved to tell. We’d spent hours talking about the history of the 30th, the men he fought with and their exploits during the war, but when he talked about Mary it was evident that she was the love of his life. In tribute to Frank and Mary Towers, I am posting their story again (originally posted in October 2015). This story was written almost entirely by Frank himself and I was honored that he let me post it here on my website. The story he sent me, a portion of his unfinished memoirs, is longer than what is included here. I hope to post “the rest of the story” about Frank and Mary during the war at a later time. In October my husband and I drove down to Camp Blanding to talk to Frank Towers, a 98-year-old World War II veteran of the 30th Infantry Division. Of the many stories he told us one of the most interesting was in answer to my question of how he met his wife. In December, 1940, Frank Towers said “Good-bye” to his girl friend and boarded a train to travel from his home in Vermont to Florida as part of Company K 172nd Infantry Regiment 43rd Infantry Division. The 43rd Infantry Division, consisting of the Vermont, Connecticut, Rhode Island and Maine National Guard, had been federalized and sent to Camp Blanding, Florida, for training. “During the preceding months, the local social organizations and churches, wishing to show the hospitality of these local organizations, extended invitations to every unit on the Post, particularly those of the 43rd Division, with “the boys” so far away from home, they wanted to make life as bearable as possible, and prevent some from getting homesick. Basically, each Company would receive so many invitations, and they were issued out on some unknown basis. Trucks would be at a designated pick-up point on Saturday evening and take the men to these sites from which the invitations had originated. Once inside of the building, there was no going outside, until the truck came for the return trip to Camp shortly after midnight. If one met a girl, and he wished to date her again, he would have to get her name and address and phone, number and from that point onwards, they were on their own. Many of the guys resented this ‘Censorship” and declined any further invitations, because they could not take the ladies outside and go to other places on their own and probably drink beer. Unthinkable in a religious town like Jacksonville. No! We were not to lead these innocent young ladies to any such immoral establishments. However, many long lasting romances resulted from these meetings. After a few weeks of refusal to attend these functions, it was determined that the invitations would be issued on a “volunteer” basis, and if not enough men volunteered, “you were assigned” this as a duty. The “boys” were all pretty frisky when it came to Saturday night, and they wanted to go where beer was dispensed, not to a “dry bar” of soda-pop and cookies !! As it turned out, I was “volunteered” to go to one of these social affairs, and I went rather reluctantly, but “it was my duty !! During the course of the evening, I met one young lady that looked rather appealing, and I asked her for a dance. We danced and chatted about home and family, and had a relatively nice evening. The outcome was, I had to have her name and address, so that we could meet again, probably at her home, and meet her family. After a week or two and some correspondence, I made the solo trip to Jacksonville, to meet this young lady, Mary-Olive Thomas, and her family, all of which went well. After one or two more such excursions, we began to get to know each other better, and enjoyed being together. On the next proposed visit, I found her not at home, but in the hospital. A few days previous, she had been struck by a speeding car, and severely injured with some broken bones, scrapes and bruises. So with a handful of roses, I trekked to the hospital and soon a “bedside romance” began to bud. So with continued occasional correspondence, we kept up our relationship. In early February we got our “priority” shipping orders to go to Camp Shelby near Hattiesburg, Miss., to do some advanced training and some marksman training there, then to proceed to Fort Ord, Calif., and await embarkation to the Pacific Theater, to become embroiled in the battles that faced the 43rd Division. This I thought, would end my relationship, with Mary-Olive Thomas, so I forgot about her. In March, while still at Camp Shelby, Miss., I was called in for an interview by my former C.O., Maj. Tudhope and the Regimental Commander, Col Buzzell, and others, acting as a Review Board, to interview prospective applicants to go to the Officer’s Candidate School at Ft. Benning, GA. Here we were to take further advanced infantry tactics and weapons training, and to become a commissioned officer. I never really got any basic infantry tactical training, and precious little weapons instruction, although I did fire all weapons and qualified with each one, as a Sharpshooter. I was selected and shipped off to Ft. Benning, GA to upgrade my status in life and to become a commissioned officer. 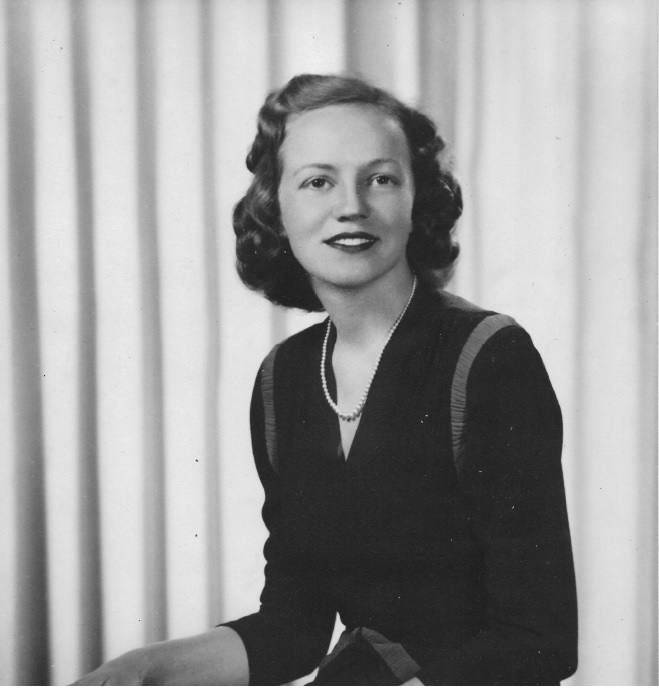 “Now from the time that we left Camp Blanding, I wrote very little to Miss Mary – there was nothing serious going on, and I was just too busy with my new academics at Ft. Benning, GA, and I just didn’t have time, and neither one of us felt any obligation to write. I really didn’t have time to do much letter writing, as having become a Platoon Leader in M Company of the 13th Training Battalion at Camp Wheeler, I had to do a lot of homework in preparation for the next days’ session of instruction. But, as time went on, I began to feel lonesome, and perhaps homesick, and started writing to her again. As time went on, I made 2 or 3 trips down to Jacksonville to see her. 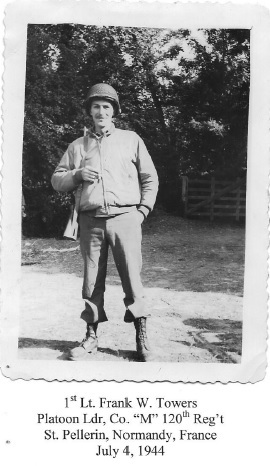 In our discussion that day at Camp Blanding, Frank continued his story about he and Mary. He said that Mary’s parents didn’t particularly approve of the “Yankee” dating their southern daughter. It didn’t help that he was Catholic and they were Primitive Baptists. That’s why Mary came to Camp Wheeler for their wedding instead of having it in Jacksonville with her family. At this time (October 2015) Frank Towers is 98 1/2 years old and his wife Mary is 96. They have been together since 1943. Congratulations to them both for their many years together. It is an honor for me to share their story. 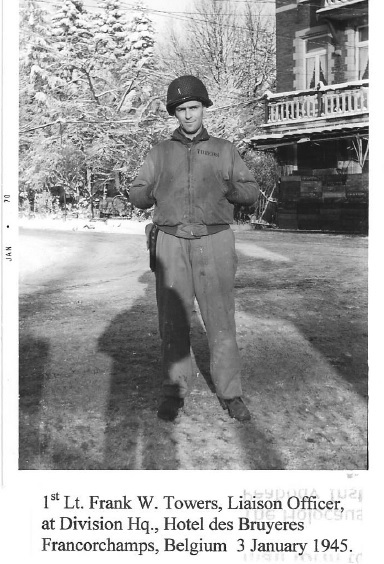 As a post script to Frank and Mary’s story, when Frank left Camp Wheeler he was assigned to the 30th Infantry Division and served with them in the European Theater until the end of the war.